Henry Victor Milner (1866-1944) was born in Hampstead. He lived in Haverstock Hill with a workshop attached to his house, situated opposite the Dominican Priory. 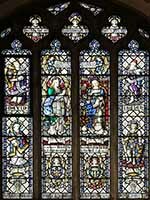 His work was very much in the style of the Gothic Revival. He had also worked with Burlison & Grylls. 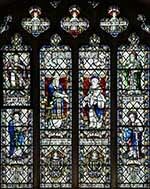 Milner was invariably used by Temple Moore in his churches and there seem to be few independent commissions by Milner recorded. 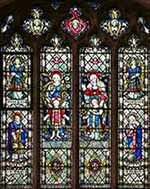 Milner's glass is noted in many churches (or restorations) by Temple Moore from 1887.